That’s me in the demo version of the latest (or at least the most obvious when you walk into the store!) Maitreya mesh body (including the demo undies that come in the box). Classic non-mesh clothing that the maker hasn’t made a mesh-AV-applier for will still of course be a problem; I haven’t heard any convincing stories about how that will ever be fixed. But of course one isn’t obliged to wear the mesh body all the time. It could be just part of the arsenal. As Evil Spock said, I shall consider it! Meanwhile, over in WoW, I’ve been playing various of my 90s through the brief pre-expansion quests to get the level 515 item and whatever achievement or title or thingie one gets (oh, right, it’s the “of the Iron Vanguard” title, and you really only need to get it once with one character and then they can all use it), and then doing other random things. although not awful; the Pandaren gear is much less bizarre-looking than the stuff that inspired her to do a set of transmogs in the first place. 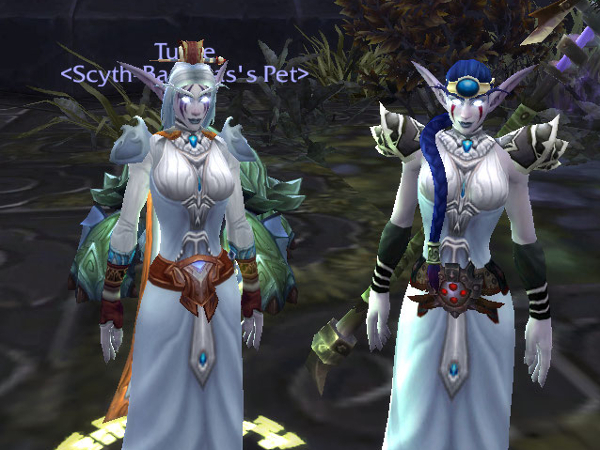 But so anyway, I was in the white transmog again, standing around with a raid group buffing up to take down the Council of Elders in Last Stand of the Zandalari, when I notice this other Night Elf Priestess, and she’s wearing like omg TOTALLY the same transmog!!! 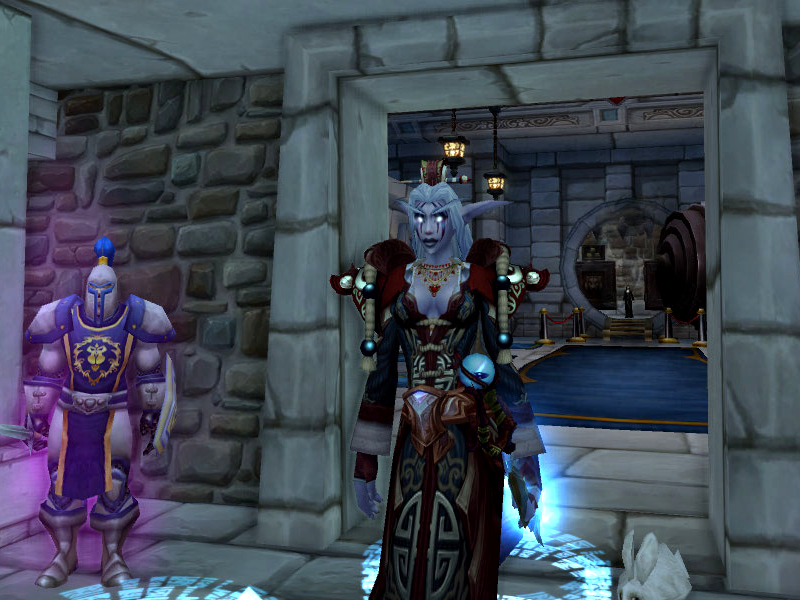 Of course it’s not really exactly the same transmog, mostly it’s that we both have Mooncloth Robes, and generally non-ornate other gear. She’s got this High Councillor’s Circlet for a nice blue gem matching the blue hair, whereas I have hair matching the robes, and an unmodified Amaranthine Cowl of the Impatient on top (not really a cowl despite the name, more a little top extension with a hairpin) because it looks good, and matches the (also unmodified) belt. Neither of us quite have the shoulders right, I’d say; I have the White Woolen shoulders or whatever that is, and they’re simple but kind of a weird shape, and actually too white for the white outfit. On the other hand her I think Shadow Council Mantle is a little too ornate for the overall look (although they do go nicely with the gloves). I’ve switched back to the Silver-Threaded Amice look for the shoulders since, and I think I prefer it. I was thinking about some evil-looking dark transmog for the Shadow Priest, but then I realized that since she spends 99% of her time in Shadowform, no one would hardly ever see it. This gorgeousness doesn’t take care of itself, y’know! Well, actually it does, but this vanity (zebra ottoman and make-up clutter included) was in a D thing at Sn@tch, so I got it. I have it up in my Unpacking Place high over the Rise, where I unpack stuff and try not to get to attached to it so that I can later derez it to make room for other stuff. I like it up there. Sheer little top also by Sn@tch, house from me (available on the Marketplace I think! ), other stuff pictured from other places I forget. Sn@tch will have all my monehs! As you will see there are no Sn@tch-n-Grab or Woeful Wednesday Specials this week. That’s cause I decided to try something new! 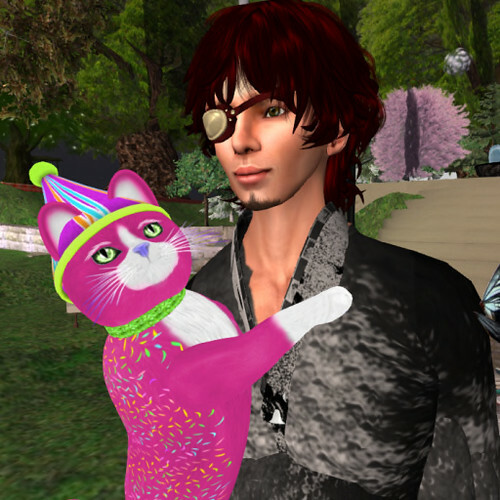 Rob made me this cute little Mesh @ sign with an arrow and this week you can find them all around the store next to certain vendors. When you find them, the item it’s pointing to is on SALE! Everything with the @ arrow pointing to it is marked down between 0L and 50 L! There are several things this week scattered around the store on every level (including the Bargain Pit) and there is something FREE this week too! I’m hoping to mix this mini sale hunt into the regular line up of specials every week if it goes well! Happy Hunting! So, being unable to resist quality things under about 75L, I have yet even more Sn@tch outfits to catch up on opening and admiring myself in! SL peoples love shopping for a cause, as do RL peoples for that matter, and while it’s just as subject as RL causes to the usual “why do you put energy into THIS when there is also THAT?” sort of questioning, I still think it is a Great Thing. The other day (was that just yesterday?) Michele passed me a notecard about Love Donna Flora, a sim-sized event to help with the medical expenses of one of our creators. The Love Donna Flora event will open on July 25th @ 12:01 AM and close at midnight on August 11th. It will feature work from more than 100 creators with proceeds going to Squinternet Larnia of Donna Flora. The arrival point point is in the center of the sim, which is a little confusing at first, but follow one of the nice cart-paths out toward the edge, and you’ll come to the main path, all around the sim, lined by picturesque carts selling all manner of things. And it’s in a good cause! Okay, with all that out of the way :) here is the real reason for the post: a picture of me! Dress (actually from the event! ): Klepsydra – Georgia – Black – Love Donna Flora. Despite being mesh :) it sort of almost fits me; M, shown here, it just a tad small in a couple of spots; L makes me look curvier than I really am. Hair: A&A Kaya, Dark Brown. A 50L special in the Attic at VreMode.